If Yast could sync with Google Calendar would be great! With the project-name as the appoitnment's title! Of course in an own shared calendar where only Yast activities are shown. This feature has been suggested several times before, but is seems like people dont really know what they want. Do you want synchronization both ways or is it enough to just display Yast entries in the calendar (this is way easier to implement) ? Seeing Yast entries in Google Calendar would be amazing! Then I could sync my google calendar with my outlook calender, and I would look so super busy to all the ppl who look at my calendar in outlook! Nice draft :) This feature has been suggested several times before, but is seems like people dont really know what they want. Do you want synchronization both ways or is it enough to just display Yast entries in the calendar (this is way easier to implement) ? PS: The Yast timebar can be used in a week-view, giving you a better overview :) We appreciate any suggestions. This reply was removed on 2011-02-03. Hi Jorgen, thanks for your reply! That would be exactly what I thought of. I'm synching my Android, my home pc, my notebook and my tablet in the future with my Google Apps account. So just an own Yast category with the time spend in any projects with the project name as the appointment-title would be very helpful to overview my workflow last week, months, to optimize my time-management even better! With this function I'd have my working appointments, private stuff and reminder automatically seperated in e. g. a privat calendar, my synched Yast calendar and so on. I saw the week-view in Yast, it's cool but it's not a calendar view at all. Hi Jorgen, thanks for your reply! That would be exactly what I thought of. I'm synching my Android, my home pc, my notebook and my tablet in the future with my Google Apps account. So just an own Yast category with the time spend in any projects with the project name as the appointment-title would be very helpful to overview my workflow last week, months, to optimize my time-management even better! With this function I'd have my working appointments, private stuff and reminder automatically seperated in e. g. a privat calendar, my synched Yast calendar and so on. I saw the week-view in Yast, it's cool but it's not a calendar view at all. I agree with CK. Just displaying Yast entries in the calendar would be a good start. Most people's 'worth' (for example for billing purposes) now tends to end up in some sort of calendar because the calendar concept is so universal, easily understood and accessible by phones and PCs on many platforms. Increasingly that calendar is likely to be Google's (especially while it maintains its offline capabilities) since GCal has so many plug-ins and apps that enable analysis and real-time extraction of events for projects and invoices. Yast is definitely the most user-friendly and logical tracker I've used so many thanks for providing it! Hi Jorgen, I agree with CK. Just displaying Yast entries in the calendar would be a good start. Most people's 'worth' (for example for billing purposes) now tends to end up in some sort of calendar because the calendar concept is so universal, easily understood and accessible by phones and PCs on many platforms. Increasingly that calendar is likely to be Google's (especially while it maintains its offline capabilities) since GCal has so many plug-ins and apps that enable analysis and real-time extraction of events for projects and invoices. Yast is definitely the most user-friendly and logical tracker I've used so many thanks for providing it! Thanks for providing a mock up of this. It clarified what people wants. One-way Yast to Google, would be fine with me. The other thing I'd really like is to be able to see the Yast week view on my Android. I like the idea too. One-way Yast to Google, would be fine with me. The other thing I'd really like is to be able to see the Yast week view on my Android. 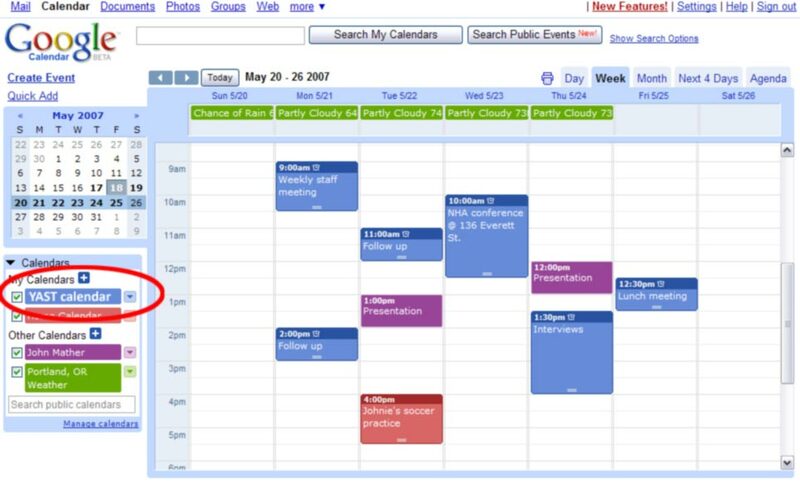 A one-way standard calendar feed would be very fine, we work with ical (mac). I'd like to have Yast integrate with my calendar as well before I decide to buy it. Check out how crisply works.